If you assume that only the unpaired electrons form bonds, then you'll have a tough time getting it to work. mmm i can think that the sulfur lost 2 electrons so its S+2 and now the sulfur is like carbon and can make bonds with 2 oxygens. ohhhh and wanted to say that meanwhile we learned only about nonmetals, and with metals we only learned about the first and second columns (Alkaline earth metal, and alkaline metals) while all of the metals in the middle of the table we still didnt learn about them because the electrons there act with different rules than the nonmetals ones like the 2,8,5 etc. i will try write SF6 like with the notebook image and see if i do it well and understand it! ok i tried to do it with my notebook, sorry about the mess. 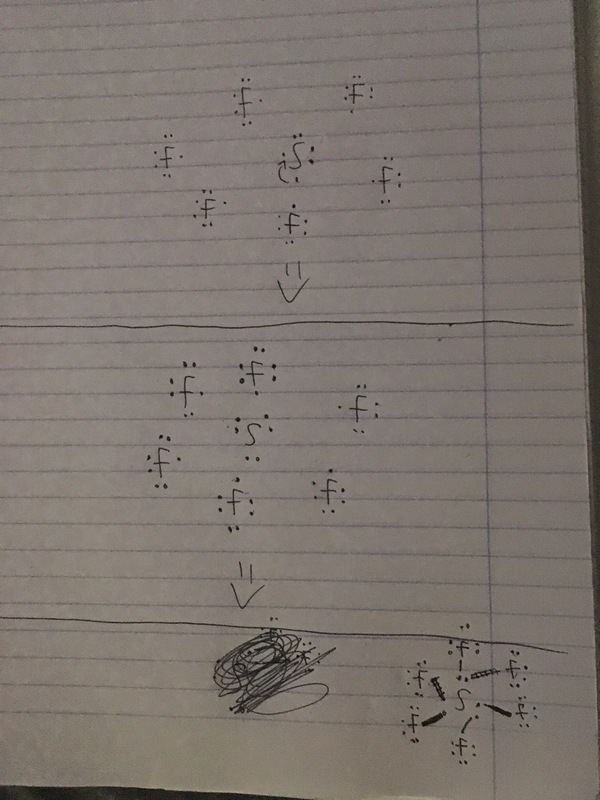 i wanted to show that the 2 electrons that not a pair in the sulfur become a pair and then every electron in some pair doing a bond with the flourine electron? Not a bad guess. However, this leads to a couple predictions which don't agree with observations. First is that the resulting SO2 molecule would have a +2 charge, while we know that in reality it is neutral. Second is that the SO2 molecule would be straight and nonpolar due to the symmetry, whereas we know it really is polar and bent. Both of these observations tell us that those two electrons must still be there, and they must be on the sulfur. You got the right idea with SF6. But don't think about it as each electron in an electron pair forming a single bond. Remember these electron dot diagrams are just a model. It is a useful tool for figuring out what the shape and bonding structure of a molecule is based on the sharing of electrons of the atoms that make it, but it doesn't tell you what each electron actually does as the molecule is formed. What the electrons 'really do' is some crazy quantum mechanics, and it's not too important for the chemistry. If you'd like some more practice with these, give ozone (O3) a try. Hint: It is not a triangular loop! Other hints: Count up the total number of valence electrons before you start (three oxygen with 6 valence electrons each gives 18 electrons to work with). All of these electrons should be accounted for in your final molecule -- either as bonds (2 electrons each) or electron pairs. Finally, feel free to move electrons around from atom to atom. Watsisname, i will try today! thanks. for now i only know energy levels of the atmos with 2,8,5 for example, while the orbitals with S,P,D letters i still dont know. maybe that what confuse me a bit because all around the internet with SF6 case i see ppl talk about the orbitals. i will try O3 today evening and will post it here. and that how our understanding of our universe is reset! The discovery of the accelerating expansion of the universe won the Nobel Prize, the Gruber Cosmology Prize, and the Breakthrough Prize in Fundamental Physics. It led to the widespread acceptance of the idea that the universe is dominated by 'dark energy' that behaves like a cosmological constant – this is now the 'standard model' of cosmology. If this proves to be true, will these prices have to be returned? Nonsense. They did not reset a thing. They still found accelerating expansion, a non-zero cosmological constant (dark energy), and derive cosmological parameters consistent with those from WMAP and Planck. Their results are in agreement with the ΛCDM model of cosmology. What is true is that they derived a smaller statistical significance for the accelerating expansion. Constant expansion is excluded to about 3 sigma. Which is not really surprising. From supernovae data at redshift between z=0 and z=1, the difference between accelerating expansion and constant expansion is very small. It doesn't become obvious until you get to redshifts of 2 and more, but that's in the realm of GRBs and quasars. So it is very hard to get high statistical significance from these data. So, yeah. They haven't changed anything fundamental about our understanding of the universe. We're still very confident that it is expanding, that it contains dark matter and dark energy, and that the expansion is accelerating. The consensus values for ΩΛ and Ωm are around 0.7 and 0.3, respectively. Which is, without question, an accelerating universe, unless we overthrow general relativity. How do I figure out how many hadley cells an alien planet may have, especially if it has different physical and atmospheric characteristics (such as radius, air temp, pressure, etc) than the Earth? Wow, that actually is a lot! Definitely not something I can do on a home PC now, isn't it? Yeah, anything involving the Navier–Stokes equations can get complicated in a hurry. However, I think I might have been too quick to conclude that modelling it would be completely necessary. It is necessary to predict all the features of circulation with precision and confidence, but we can still get some insight to how many cells it is broken up into by the planet's rotation. On a non-rotating planet (with equatorial heating, which is rather contradictory, but useful to visualize the physics), you get the classic Hadley cell. Warm air rises at the equator, which produces low pressure and a return flow from the poles. Don't worry, I'll turn this into something sensible and usable. This formula says the zonal winds on Earth at 30° latitude would be 134m/s, and even faster closer to the poles, which is unrealistic. The flow would break up into turbulence. In fact, we observe that the Hadley cell is broken up at approximately 30° intervals, so we have 3 cells in each hemisphere. 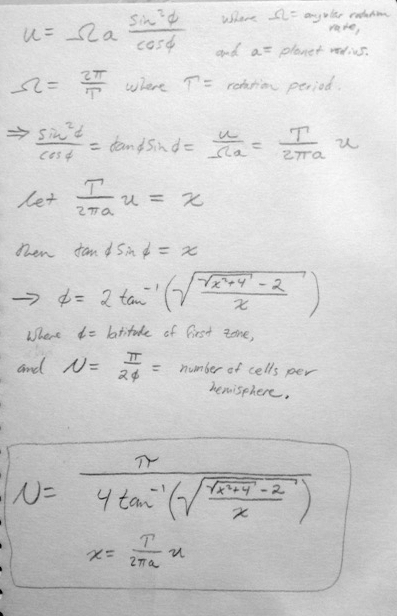 Let's use the predicted wind speed at the latitude for which we observe the cell structure get broken on Earth as a way to tune this model to predict the number of cells on other planets. This is an incredibly sloppy ad-hoc way to make a model, but as we will see, it happens to work reasonably well in many cases. There will definitely be exceptions though, so we'll need to make note of where and why it could fail. u is the "critical zonal wind speed" that, for Earth, we computed to be 134m/s. x(Earth) = (24 hours)*(3600s/hr)/(2*pi*6371000m)*134m/s = 0.2889. Plugging 0.2889 in for x, we get N = 2.9989 (this is 3, we just got error from rounding). Jupiter rotates once in 9.925 hours (35730 seconds) and has an average radius of 6.991*107 meters. Then x is 0.0109, and we get N = 15.06. So this predicts 15 belts and zones on each hemisphere of Jupiter. So this is not exact, but it seems pretty close. Definitely within a factor of 2. Let's try Venus. We know Venus has a very slow rotation and it has only one Hadley cell. So far, so good! But we should take it only as a rule of thumb which is generally close to correct, not a precise universal fact. Indeed, it fails for Mars (it predicts two cells, but really there's just one.) This is because Mars has a very thin atmosphere which is quick to respond to changes in radiation, and a lot of the mass of the atmosphere is exchanged with the ice caps. And for other planets in general, the reality may differ for these and other reasons. This is why the global circulation model is really required to get a complete handle on what happens in the atmosphere. Finally, an article (or at least a guest blog) which actually understood the significance of the recent paper about deriving cosmological parameters from supernovae data, unlike nearly every other pop-sci article on the internet which lead readers to think the universe isn't accelerating or that dark energy doesn't exist. Thumbs up to Scientific American for good science reporting. Yeah, that's quite a bit better than a large number of articles and online discussions that I have seen. But what I had not seen anywhere is a discussion of how the supernovae data fit in with the data from the other two methods (CMB and BAO). If we take the new supernovae data on their own, then we get 3 sigma [99.7%] confidence that there is dark energy and the universe's expansion is accelerating. With all methods combined, we get greater than 5 sigma confidence [99.99999%] . Basically, BAO data do not constrain the amount of dark energy at all, but they do tell us that the matter density cannot be much less than 20% of the critical density, or much greater than 40%. CMB data tell us that the density of dark energy and matter together must add to about 100% of the critical density. (Equal to 100% if dark energy is 70%, a bit less than 100% if there is more dark energy, and a bit more than 100% if there is less dark energy). Note: it is possible for a universe to have more or less than 100% of the critical density. Having a different density changes the spatial curvature, which means the rules of geometry are different from those of Euclid. Put together, these data exclude all but a very small range of possibilities. Dark energy must be around 70% the mass density of the universe, and matter must be about 30%, to give a sum of 100% which makes the universe spatially flat. The regular matter that we can see is only about 5%, so that gives about 25% dark matter. What's curious is how the new study arrived at uncertainty ellipses which are larger than previous studies, despite using more data. I'm not sure if this is an effect of their methods for error analysis, or a quality of the supernovae added to the sample. Even more curious is that their whole distribution is moved down and to the right by quite a bit. It disagrees with the overlap of CMB and BAO data by 2 sigma. Which isn't terrible, but it does beg for explanation. Is the new study off, or are CMB and/or BAO data off? Perhaps even all three! This is what cosmologists need to focus on. Im watching this infotainment show depicts various doomsday scenarios, and this one is talking about GRB's. The event in question in this episode is a star-merger GRB. From the point of the merger event, how wide is a GRB ray, in terms of degrees in a circle? Is it always the exact same width for each merger GRB? And do supernova GRB's differ from merger GRB's in any way at all? Edit: Watsisname, thank you for the formulas, I'll give them a try! From the point of the merger event, how wide is a GRB ray, in terms of degrees in a circle? Probably not much less than a degree, or much more than ~20 degrees. Most likely toward the lower end of that range. The angle is very model dependent, and it almost certainly depends on what causes the GRB as well. I should probably talk a little more about that, and the history of GRB research. GRBs were first detected in the 1960s (by classified surveillance against nuclear detonations), but it wasn't until the 90s with a dedicated gamma-ray observatory that their study really took off. It did not take very long to realize that they were so far away -- and therefore so bright -- that they can't be radiating their energy isotropically (equally in all directions). To provide that much luminosity in all directions they would have to quickly convert several times the mass of the sun into energy, and we know of no plausible way for that to happen besides the merging of black holes (which don't emit that energy as light). So models began to be built under the premise that the energy was being radiated in a confined beam, and they appear bright if the beam is aimed in our direction, just like with pulsars. How confined, though? And what causes it? That's what's really hard to answer, and it varies by the model. Much of this model variance is due to the variability of GRBs themselves. They have an astoundingly diverse range of behavior in terms of brightness over time. They're almost like snowflakes -- each one a bit different. This was a very tough puzzle to crack and a huge amount of astrophysical research was (and still is) focused on it. To emphasize it, here's a list of some of the studies on GRBs in a literature review. Give it a quick skim just to blow your mind. And one of my favorite individual papers is this one by Tsvi Piran, which gives a great treatment of many important aspects of GRB physics. The most successful models are all based on creating an extremely fast jet, but they differ in what kind of engine powers it. We know that whatever it is, it must allow a lot of gravitational potential energy to be turned into kinetic energy, and a good way to do that is by merging massive objects like neutron stars together, or by the collapse of very large stars. We can run some simulations of these kinds of events to get some insight on the jet formation, but it's a really complex computational problem involving hydrodynamics and general relativity. We can also get some insight into the dynamics of the jet by studying the after-glow of the bursts. This is the long-term, lower-energy emission which we think is caused by the jet slamming into the intervening medium, releasing energy through shock fronts. Unfortunately, this is also fraught with complexity and sometimes ambiguous results. But it's enough to give us some rough constraints on how narrow they are.